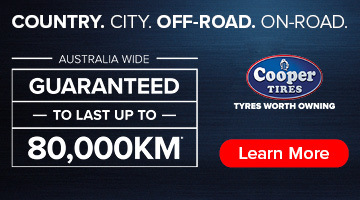 Portland, Victoria is a ripper coastal town located 100km west of the Great Ocean Road. 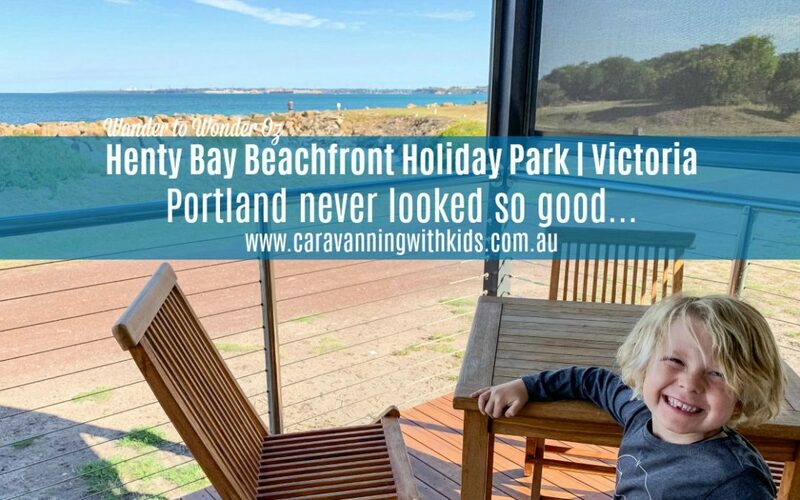 This town is teeming with history, wild life and natural wonders, plus a fantastic caravan park in Henty Bay Beachfront Holiday Park. Henty Bay Beachfront Holiday Park is set on 10 acres of beach frontage a mere 5 minutes from town. 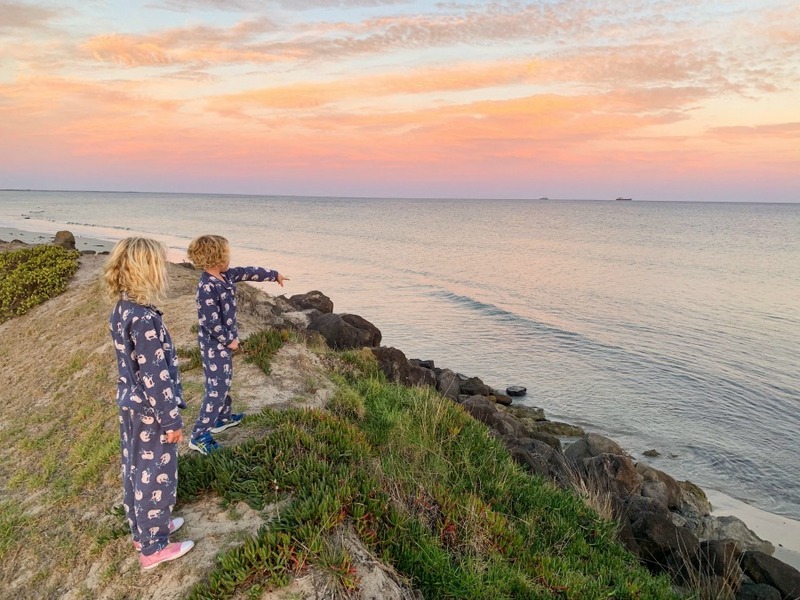 Watching the sky change colour over the ocean as the sun sets and the lights of the ships and harbour shining bright right from the comforts of your sight… it is truly magical! 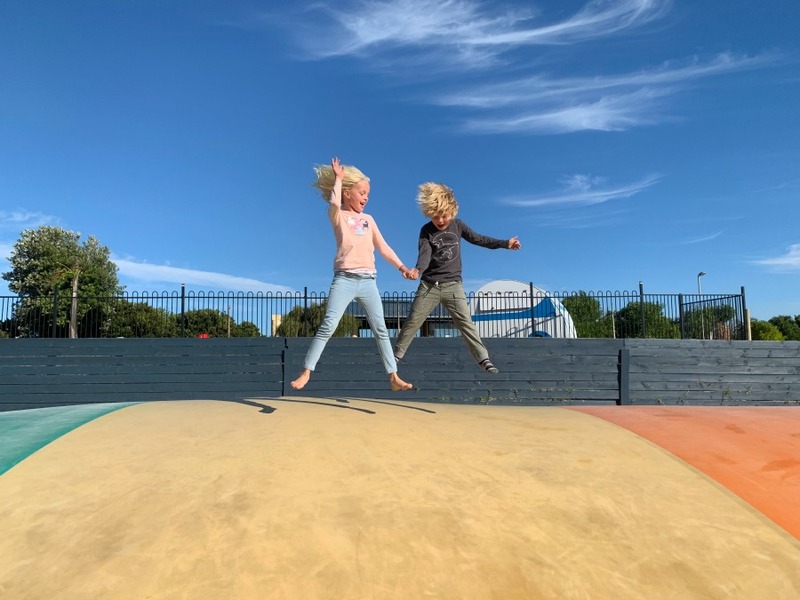 The park offers a staggering range of accommodation from luxury self contained 1, 2 & 3 bedroom villas to classic cabins, ensuite powered & unpowered camp sites, a 4 bedroom holiday house and a dorm style ‘bunkhouse’ perfect for groups. 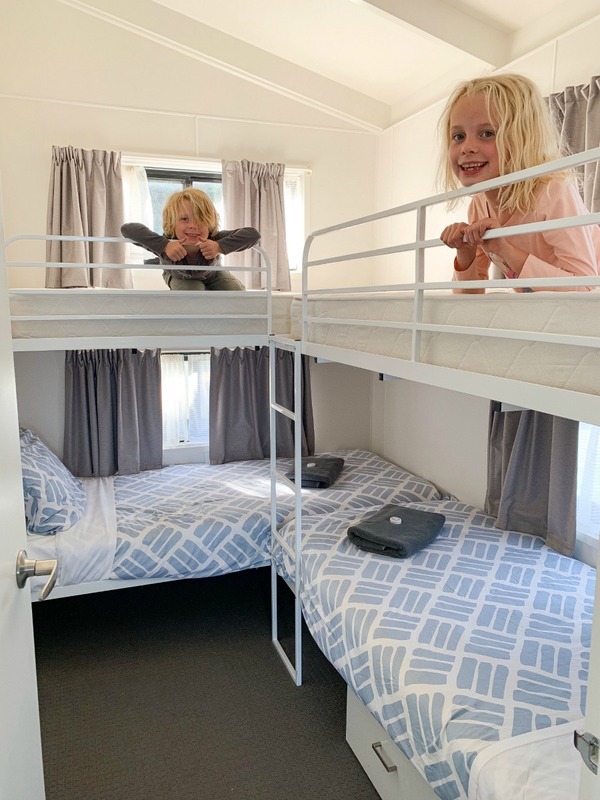 We decided to leave the caravan at home and instead stayed in a 2 bedroom cabin right on the beachfront affectionately known as ‘Nemo’. 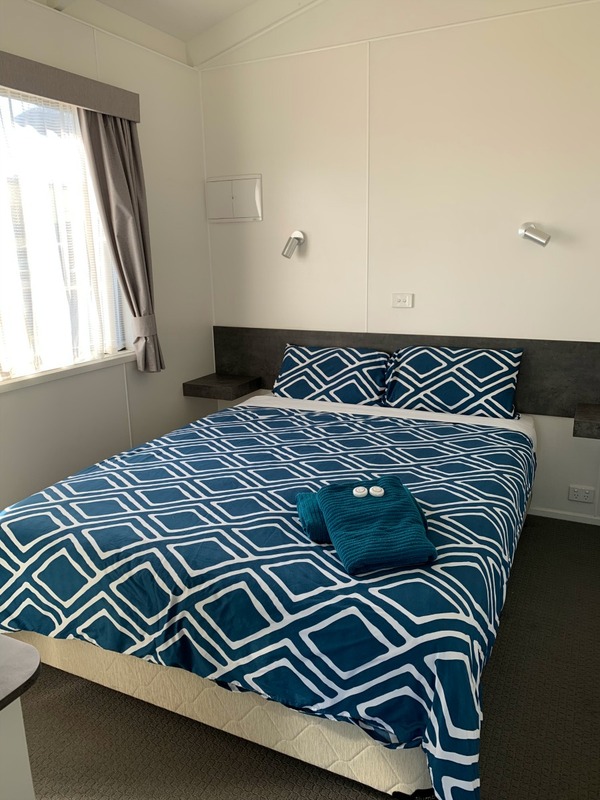 The cabin was modern, clean and well laid out, with main bedroom, second bedroom with two sets of bunks, lounge, bathroom, dining and well equipped kitchen. Given the poor weather conditions at the time of our visit, boy were we grateful for the extra space! 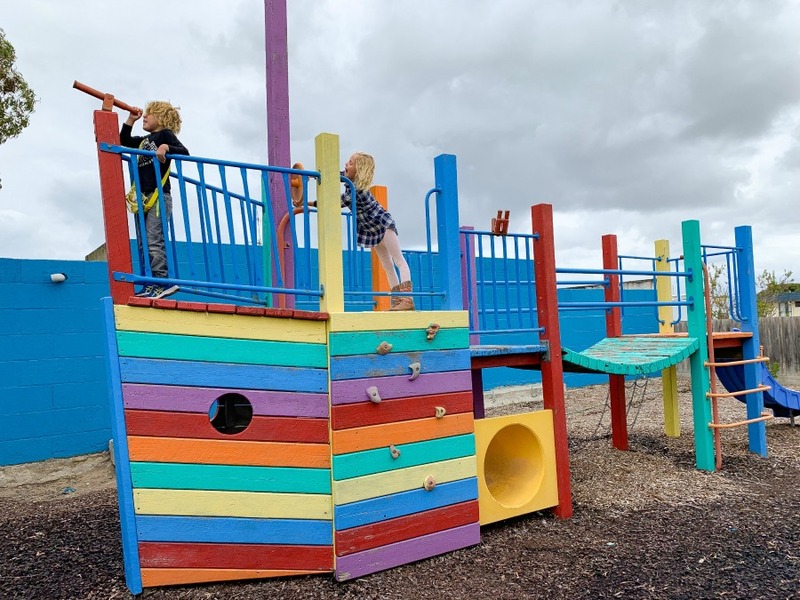 Henty Bay Beachfront Holiday Park offers some great kid friendly attractions and we certainly put them all to good use! 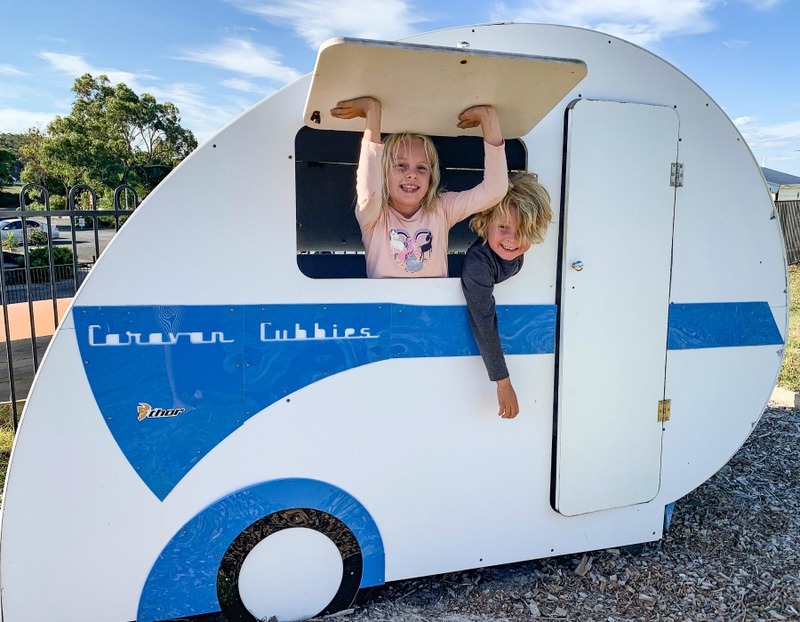 The jumping pillow was a hit as always, but it was the cute caravan cubby house and rainbow adventure playground that really impressed our children. 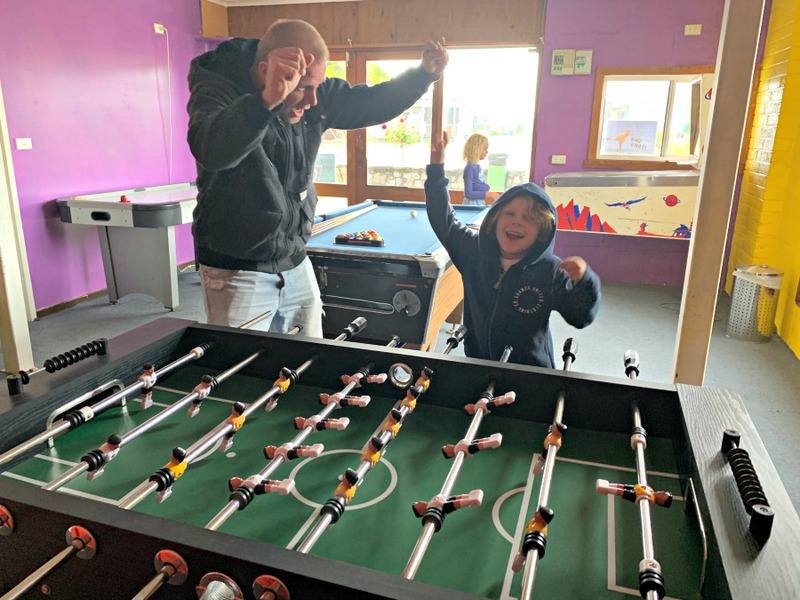 The recreation room, while slightly dated offered a pool table, air hockey table, foosball table and small TV, creating a perfect location to chill out or escape the weather like we did. 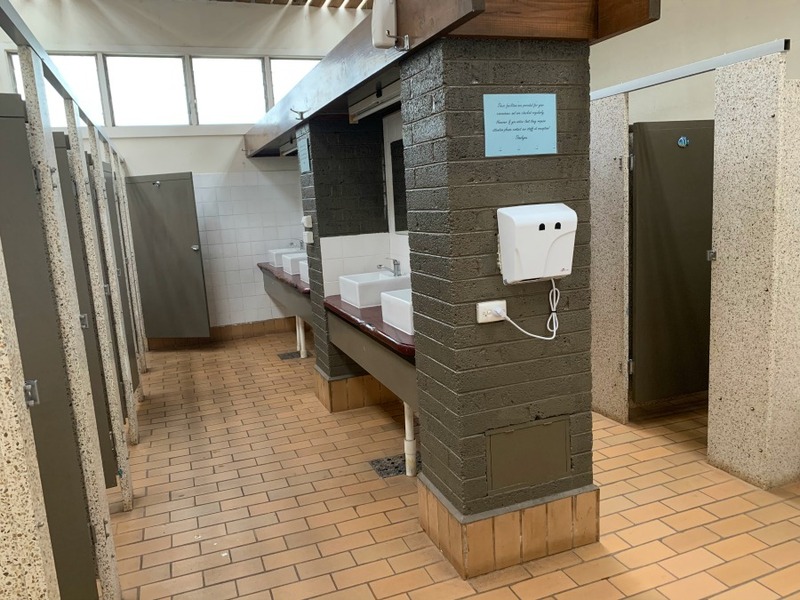 The bathroom amenities were large and clean, even offering a small bath in a family section, which we always appreciate along with a special needs bathroom/ensuite. There were also ample laundry facilities. 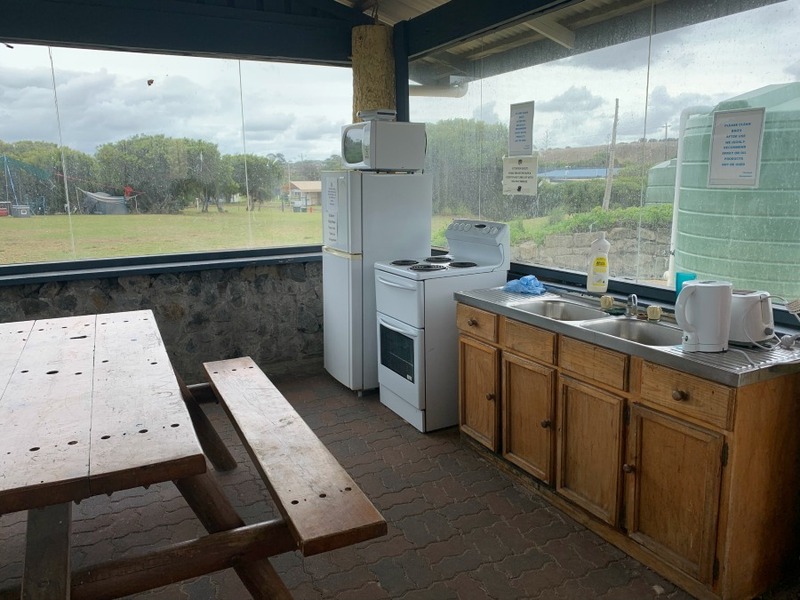 The camp kitchen sits up on the hill overlooking the water offering ocean views and everything you need – chairs and table, fridge, oven, microwave, toaster, kettle and BBQ. If you’re a keen fisherman then Henty Bay is definitely for you! Portland is renowned for deep-sea fishing and at Henty Bay you can fish right off the beach. There is a small boat-launching ramp, wash down area, large dedicated boat parking area, boat and caravan storage and ample free fish freezing facilities. You can even grab your bait from the kiosk at reception! If fishing is not your thing then don’t despair, you can order some freshly cooked fish and chips from reception to enjoy back at your site or on the beach. We had a great feed and loved the convenience of not having to leave the park. 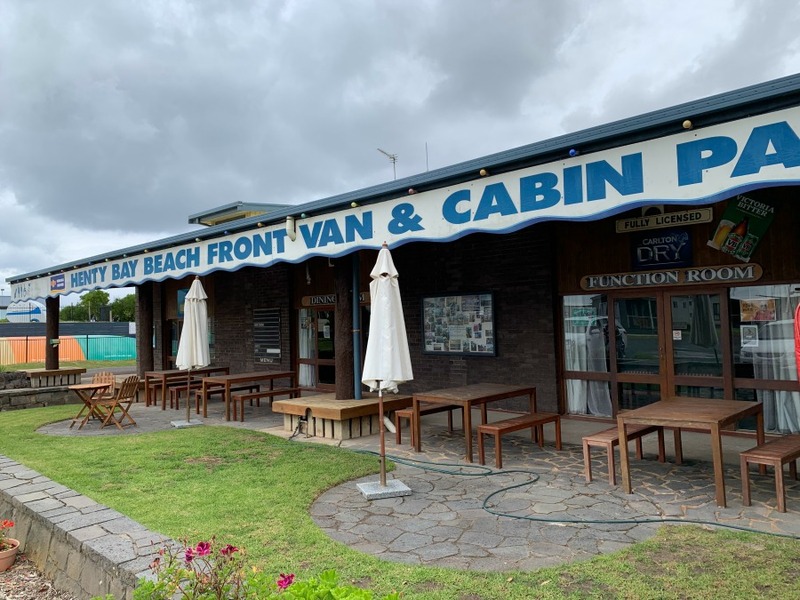 Henty Bay Beachfront Holiday Park is also licensed so you can even grab a drink in their sports bar. 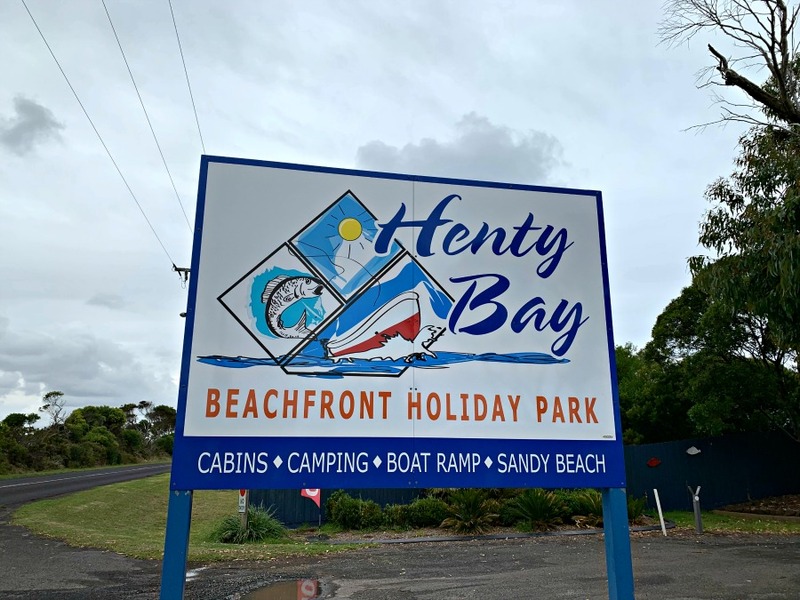 Henty Bay Beachfront Holiday Park is a part of the Family Parks group and we were excited to see it was a pet friendly park. When we visited there were plenty of furry travel companions enjoying the large park and beachfront. 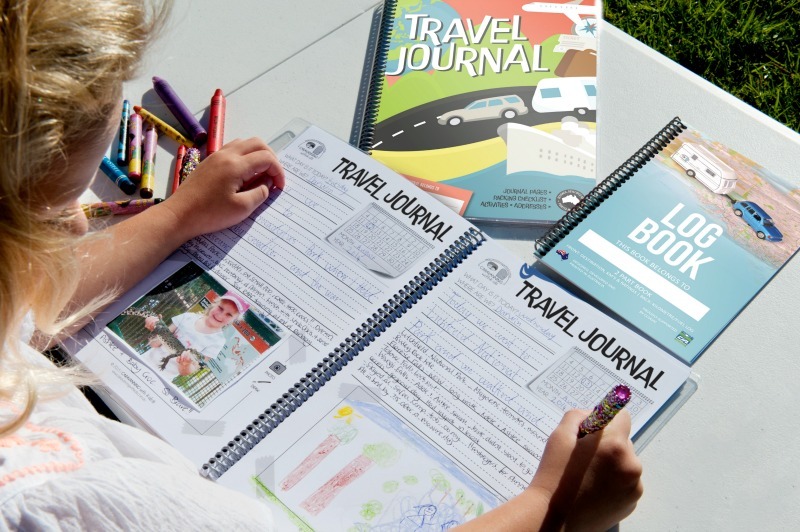 They are also TAWK supporters, which means the kids stay free for two nights!